All purpose foam coat! This rock-hard cement-like coating protects and beautifies your foam projects. Comes in a dry powder - simply mix with water. It's tough but still sandable. It is inherently fire resistant. Can be used outdoors when sealed with any outdoor paint, or mixed with Boost liquid fortifier, or Bounce liquid rubberizer. Apply thick with a trowel or thin with a paintbrush. Sets up in only about 15 minutes. Extend the drying time by adding up to 50% latex paint with your water before mixing into the dry foam coat. 3lbs covers up to 30 square feet. 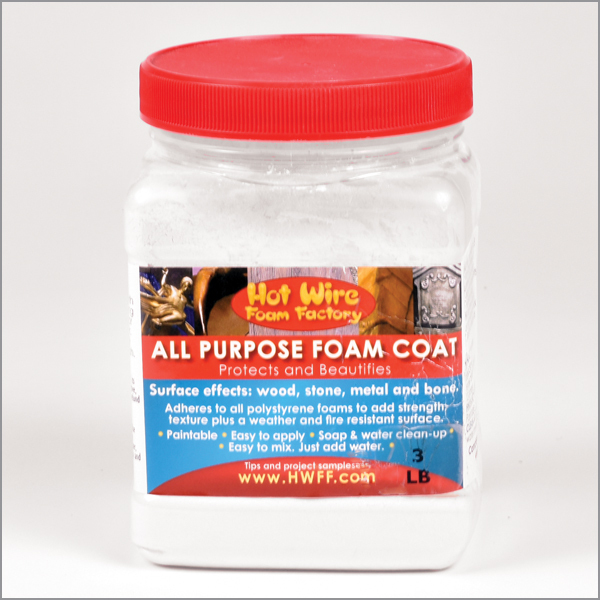 Dollar-for-dollar, our Foam Coat covers 4x as much as Rosco Foam Coat, is at least as strong, and has a longer shelf life. Plus it's compatible with HW Boost, Bounce, and Grit! MIXING: Mix in a clean container with clean water. Use 1 part cool water per 3 parts of powder (for example, 1 cup of water per 3 cups of powder). Add powder to water and mix until Foam Coat turns to a smooth paste. Do not over mix. APPLYING: Fill big cracks and holes by applying pasty mixture with a trowel. You may add more water until mixture is thin enough to apply with a paint brush, although thinning weakens coating. Use thinned mixture to texture large areas. May be applied as thick as 3/8 inch. Try texturing surface before coating sets. SET TIME: Use within 10 minutes. Sets hard in 30 minutes. Maximum bond and hardness in 24 hours. FINISHING: Remove dust before painting. This product goes on smooth and can be sanded. Can be used outdoors if sealed with paint. Add Grit texturizer to create a rock-like surface effect. CLEAN-UP: Clean tools and brushes with clean soapy water before coating hardens.